The previous pages have explained three very different methods for defining a color: (1) the measurement of the color stimulus as a spectral emittance or reflectance curve in colorimetry; (2) the proportional responses to the stimulus by the L, M and S cones, represented as a chromaticity diagram; and (3) the subjective description of the color sensation in terms of lightness, hue and hue purity, the three colormaking attributes. These methods focus on the physical stimulus, receptor outputs or color sensation, respectively. This page describes how these different aspects of color perception fit together. For example, how is the physical stimulus (luminance) related to a measure of sensation (brightness)? How can we show that red is more similar to blue than to green? Does the brightness of a color change as its chroma increases? Mapping the quantities of a physical stimulus onto color sensations is called psychophysics, and it was the earliest form of color specification. This geometrical approach was innovated by the 17th century naturalist Isaac Newton, who summarized his experiments in light and pigment mixing as a hue circle, the first geometrical model of color perception. This evolved into the painters' many color wheels and is incorporated into all modern color models. Another important psychological model was proposed by a physiologist, Ewald Hering, who tried to deduce the physiology of color vision from subjective color experiences. For several decades his opponent process theory was seen as an unsatisfactory alternative to the trichromatic theory, but today both theories are included in models of color vision. Hering's model, like Newton's, seems to assume a mind of geometrical regularity or symmetry. Unfortunately, the functional relationships between color stimuli, color receptors and color perceptions are not that simple. Tracking the changes from cones to colors shows the many complex adjustments that are necessary to create visual experience. The geometry of colormaking attributes reveals that no single geometry can adequately unify all the different ways to measure color. Perhaps the ultimate color description occurs in the translation of color sensations into color words. Hering's four unique hues have been frequently used in linguistic research in the hope that the usage of common color words might uncover the fundamental reference points of human color experience. One of the most important aspects of color psychology emerges when we're asked to make judgments of color similarity. Color Similarity. If we think in terms of the visible spectrum, it seems obvious that yellow and green are more similar than red and green: "yellow" light is closer to "green" light in the spectrum band. Spectral closeness seems a reasonable way to judge the similarity among colors. But ask yourself, which hue is more similar to red: green, or purple? Although purple is at the opposite end of the spectrum from red, most people would answer that purple and red are more similar. which hue is more similar to red: green, or purple? Why? Because of the way color information is coded by the eye. The extreme "blue violet" end of the spectrum seems also to contain some "red" light. The reflectance profiles of magenta or purple paints show that these colors stimulate both the L and S cones in higher proportions than the M cones. Because the L cones are stimulated by red or violet surfaces, we judge these to be similar colors  in the same way that yellow green seems similar to blue green, because the M cones are stimulated by both. However, magenta and red violet, the bridging hues between red and blue violet, are not spectral lights. They cannot be found anywhere in the spectrum created by a prism or rainbow, even though "red" and "blue" light, when combined, produce those colors. Newton's Opticks. This light mixing discovery was made by the English physicist and mathematician Isaac Newton (1642-1726), who first described the many optical and color experiments he performed in the late 1660's to the English Royal Society in 1672, and after an interval of more study and contentious public discussion published them in his Opticks of 1704. (That's the English edition; a scholarly Latin translation appeared in 1706.) Newton had experience grinding his own lenses and was attempting to understand the problem of chromatic aberration that introduces fringe colors into optical images. He knew of the "celebrated Phenomena of Colours" described in experiments with pentahedral (triangular in cross section) prisms performed decades earlier by Guido Scarmiglioni, Thomas Harriot and Marcus Marci. But he pursued these studies much further in experimental thoroughness, observational precision and logical clarity. The revolutionary aspect of Newton's work was his emphasis on keeping separate the physical and sensory (mathematical and psychological) aspects of color  a scientific strategy advanced in the treatises of Galileo Galilei. 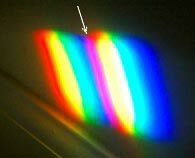 Newton demonstrated that each spectral hue has a unique and measurable refrangibility or angle of refraction when passed through a lens or prism. In his Experimentum crucis ("decisive experiment") and variations of it, he showed that this characteristic of light remains constant even if the light is blended by a lens, sent through multiple prisms, or passed through a colored filter. The Light whose Rays are all alike Refrangible, I call Simple, Homogeneal, and Similar; and ... The Colours of Homogeneal Lights, I call Primary, Homogeneal and Simple. Newton frequently pointed to the similar sensory properties of light and sound and, in imitation of the diatonic musical scale (produced by the white keys of a piano), he (or rather a sharp eyed assistant) identified seven "primary or simple" colors of light in the spectrum  red, orange, yellow, green, blue, indigo and violet. In Newton's view, spectral "orange" or "indigo" light was just as primary, homogeneal and simple as "red" or "green" light, because none of these hues by itself could be altered or separated by refraction into any other colors. But he found they could be mixed. In particular, he discovered a region of new colors that were known in isolated natural exemplars such as gems and flowers but that did not appear in a prismatic spectrum. Instead, these extraspectral hues  which include "violet" (purple), "red violet" (magenta), "violet red" (carmine) and "red" (unique red)  appeared by overlapping the "orange red" and "blue violet" ends of two separate spectra (right). And he found that recombining three or four colors of the spectrum through a lens reconstituted the original "white" color of sunlight. The Hue Circle. Newton summarized these striking observations as an ingenious new color model: he joined the "orange red" and "violet" ends of the spectrum to create a hue circle. This circle still shows the spectrum as a continuous gradation of hues from orange red to blue violet, but now the ends are joined via the "artificial" or mixed colors red, violet red, red violet and violet. In this diagram, the center of the circle (O) is "white" (colorless) light, and the circumference represents the "fiery" (saturated) colors of every spectral hue. The distance from the center to the edge indicates the range of unsaturated colors  the drab or whitish colors of the everyday world  between white and homogeneal hues. The hue circle is not just an artifice to make a home for extraspectral purple. Newton explained that it provides a geometrical method to calculate the chromaticity (hue and saturation) of any light mixture. He declared that two or more spectral "primaries" combined in specific quantities or "weights" would produce a mixture color that was located at the "center of gravity" (weighted average) among them all. The method is like finding the balance point of a circular cake pan with different sized weights placed around the rim (right). If the point Z fall in or near the line OD, the main ingredients being red and violet, the Colour compounded shall not be any of the prismatick Colours, but a purple inclining to red or violet, accordingly as the point Z lieth on the side of the line DO towards E or towards C, and in general the compounded violet is more bright and more fiery than the uncompounded. Newton emphasized that the hue circle only applies to light mixtures. Pigment mixtures would not depend on the proportional weights or quantities of the pigments in a mixture, but on "the quantities of the Lights reflected from them." He verified that colors arise in pigments and in natural surfaces because they reflect some spectral colors and absorb others. All colour'd Powders do suppress and stop in them a very considerable Part of the Light by which they are illuminated. For they become colour'd by reflecting the Light of their own Colours more copiously, and that of all other colours more sparingly, and yet they do not reflect the Light of their own Colours so copiously as white Bodies do. ... And therefore by mixing such Powders, we are not to expect a strong and full White, such as is that of Paper, but some dusky obscure one, such as might arise from a Mixture of Light and Darkness, or from white and black, that is, a grey, or dun, or russet brown, such as are the Colours of a Man's Nail, or of a Mouse, or Ashes, of ordinary Stones, of Mortar, of Dust and Dirt in High-ways, and the like. And such a dark white I have often produced by mixing colour'd Powders. ... Now, considering that these gray and dun Colours may also be produced by mixing Whites and Blacks, and by consequence differ from perfect Whites, not in Species of Colours, but only in degree of Luminousness, it is manifest that there is nothing more requisite to make them perfectly white than to increase their Light sufficiently. ... and this Newton accomplished by illuminating the gray mixtures with a single beam of sunlight in a darkened room, or by comparing the sunlit mixtures to a shaded piece of white paper. These mixing experiments with pigments and lights reveal Newton's fundamental preoccupation with the analysis of "white" into the compounding of different primary colors. Newton's hue circle implied that different combinations and proportions of primary colors would equivalently mix to white; white (or gray, in pigments) could be created by many different combinations of spectral light. If only two of the primary Colours which in the circle are opposite to one another be mixed in an equal proportion, the point Z shall fall upon the center O, and yet the color compounded of those two shall not be perfectly white, but some faint anonymous [diluted and unnameable] Colour. Newton also did not explain that some spectral hues are more luminous or have a higher tinting strength than others, which means they have inherently more weight in color mixtures and should be either located farther from the "white" center of the hue circle (as they are in some chromaticity diagrams) or overweighted in the "center of gravity" calculations. Finally, Newton's parallel experiments with pigments and lights misled many readers into thinking that pigments and lights mix in the same way, which only confused 18th century "color theorists". Newton's Legacy. It is difficult from a modern perspective to grasp the extraordinary originality of Newton's color theory. Perhaps the most important breakthrough in the Opticks is the use of geometry  the circle  to explain color mixtures, not as a medieval symbol of completeness or unity, but as the framework for a mathematical analysis of hues in a color mixture. This linkage between physical quantities and sensory qualities is the essential principle of psychophysics. 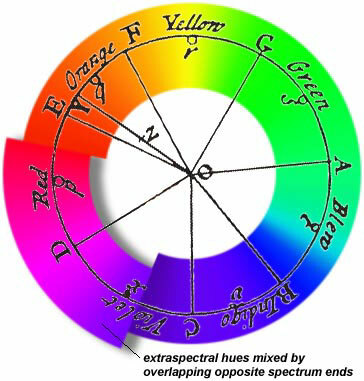 According to Newton, at least seven spectral hues or "simple" colors of light were necessary to describe all color mixtures. The arbitrary distinction between "real" and "illusory" color is swept away: all color arises in mixtures of light, no matter whether the light comes from a prism or the reflectance qualities of colored powders. These ideas went far beyond the 17th century dyer's lore that three primary colored paints or dyes defined color mixing. A key aspect of Newton's work, as his contemporaries saw it, was that he refuted the color theory inherited from Aristotle, in which "light" and "dark" were the two antagonistic primitives that mysteriously combined, like an oil slick on water, to create the iridescence of color. Newton showed just the reverse was true: white is not the acme of all color phenomena but a murky muddled mixture, no purer than dust or dirt; many different mixtures of three or more spectral colors would produce the same "faint, anonymous" or near white light. Black was not a "color" at all but merely the absence of light. Newton insisted that color was a sensation in conscious experience or the "Sensorium". But this clearly implies that the hue circle is a mental structure, not a physical property of light. The psychologist Roger Shepard demonstrated this by asking college students to choose a numerical rating that described the apparent similarity between every pair of colors in a set of 14 Munsell color chips whose dominant wavelengths were matched to spectral hues. (He excluded extraspectral purple and magenta to avoid inducing a circle where none existed.) He then used a multidimensional scaling program to translate these similarity judgments into a map, where dissimilarity is represented as distance (diagram, right). This procedure accurately recreated not only the ordering in the hue circle but also the perceptual spacing and complementary opponency between hues, as these are defined in modern color models. Newton's book was intended for an audience of Enlightenment naturalists, and it was widely read. The English mathematician and perspective theorist Brook Taylor (1685-1731), who was also a talented amateur painter, pointed out in his New Principles of Linear Perspective (1719) that "the knowledge of this theory may be of great use in painting", and then explained in general terms how to apply it to mixing paints  though Newton had cautioned that his circle only applied to mixtures of light. From this misconception all artists' color wheels have branched and bloomed. Despite the fact that some Continental scientists found Newton's color mixing experiments difficult to replicate, or refused to accept his refutation of ancient color theory, Newton's book had a decisive (and hotly debated) impact on 18th century color concepts. After centuries of futile and confused speculation about the origins of color, his book separated the mental from the physical attributes of color and laid the foundations for its scientific study. 1. Every color sensation may be analyzed into three mathematically determinable elements: the hue, the brightness, and the brightness of the intermixed white. 2. If one of two mixed lights is continuously altered while the other light remains constant, the appearance of the mixed light is also continuously changed. 3. Two colors, both of which have the same hue and the same proportion of intermixed white, also give identical mixed colors, no matter of what monochromatic lights they may be composed. 4. The total luminance of any light mixture is the sum of the luminances of the lights mixed. For every hue of monochromatic light, there is another monochromatic color which, when mixed with it, gives colorless light. Grassmann clarified the principle that mixtures of light are additive in hue, brightness and chroma (mixture with "white" light), and therefore that color sensations are related to light mixtures according to quantitative principles. He also showed that every monochromatic [homogeneous] hue has a monochromatic complementary color  or (a point Grassmann missed) a mixture of extraspectral "red" and "violet" hues  which produce "white" when mixed together (diagram, right). Today these principles, in a more algebraic version, are known as Grassmann's Laws. They formed the theoretical framework for color experiments by Helmholtz and James Clerk Maxwell in the 1850's. These established the trichromatic model of color mixture, and the modern study of color perception. One consequence of Newton's clarity about the physical attributes of color was that 18th century scientists were able to identify areas of subjective color experience, in particular the appearance of complementary hues induced by a strong color stimulus that can be observed in afterimages, simultaneous color contrasts and complementary shadow contrasts. These research pursuits evolved into a Romantic color theory emphasizing the conflict or antagonism between complementary colors, including light and dark. These themes were famously summarized by the German poet and bureaucrat J.W. von Goethe in his Farbenlehre (1810) and elaborated in the early 19th century by German speaking philosophers and scientists, in particular the Bohemian physiologist Jan Purkinje (1787-1869) in his New Subjective Reports on Vision (1825). By the 1850's this anecdotal and speculative approach to color was largely displaced by psychophysics or the quantitative study of stimulus and sensation. This discipline emerged in Germany, through the work of Ernst Weber (1795-1878), Gustav Fechner (1801-1887), Wilhelm Wundt (1832-1920), Hermann von Helmholtz and others. Psychophysicists developed the experimental methods and mathematical equations necessary to link the intensity of a basic sensation to quantitative units of the physical stimulus  weight in relation to mass, brightness in relation to light intensity, pitch in relation to frequency of vibration, and so on. At the same time, biologists developed the laboratory and dissection methods necessary to understand the physiology of sense organs and the nervous system. As a result the sensory and biological structure of perception began to be viewed as an integrated mechanism obeying basic laws that quantify the connection between mind and matter. This is the historical moment in which Bohemian physiologist Ewald Hering (1834-1918) launched a new defense of subjective color experience and color antagonism, published as the monograph Zur Lehre vom Lichtsinne (On a Theory of the Light Sense) in 1874 and as a book in 1878.  deuteranopia (green colorblindness, caused by a lack of the M cones) does not cause the point of maximum spectral luminance to shift from "green" wavelengths toward "red"
 most colors of the spectrum seem to shift in hue as they brighten or darken (the Bezold-Brücke effect), but these shifts do not appear in a pure blue, green or yellow. 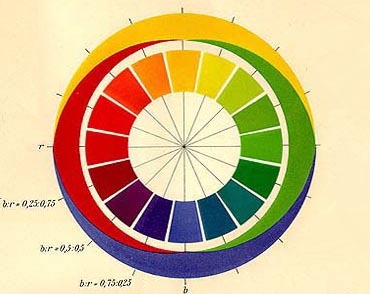 Based on clues of this kind, Hering asserted the perceptual primacy of four Urfarben or "primordial colors", known in the USA as the four unique hues: red, yellow, green and blue. He conjectured that they were produced by visual substances or processes located somewhere in the visual system outside the retina. He was vague about the physiology but precise about the "pure" form of the unique hues, which he equated with the color of monochromatic lights at 470, 500, 570 and 700 nm. Hering's Opponent Processes. Hering then turned to color mixtures. He observed that light or surface colors can produce a sensation of red mixed with yellow (orange) or red mixed with blue (purple), but never create the sensation of red mixed with green ("reddish green" or "greenish red") or yellow mixed with blue ("yellowish blue" or "bluish yellow"). This proved to Hering that the visual substances were organized as antagonistic or opponent processes. In one process assimilation of visual substance produced the red sensation and dissimilation produced the green sensation; the other process produced the opponent sensations of yellow and blue. When the visual substances were neutralized or in balance, both hues associated with that opponent process disappeared. Hering also observed that we commonly lose color vision at night, yet still see light and dark, which convinced him that luminosity is separate from hue as a color vision process. So he proposed two additional "colors", white and black, that create the perception of brightness or lightness and also affect color chromatic purity by mixing with any of the unique hues to create less intense (desaturated) colors across the complete range of shades, tones and tints  which Hering called veiled colors. However, he conceded that yellow and red had an "inherent brightness", and green and blue an "inherent darkness", which mingled perceptions of hue and luminosity, and that white and black did not disappear at balance but produced the positive sensation of gray, which meant that black and white are not linked as opponent processes. The achromatic sensation of middle gray results when all the substances and opponent processes are in balance. Hering took pains to fit his theory to Newton's hue circle. Roughly half the hues on the circle can be described as containing some yellow, and the other half some blue; these semicircles overlap with two opposing spans of red and green, oriented perpendicular to the yellow and blue like four hue compass points. Binary mixtures of any two neighbor unique hues (one hue each from the two opponent processes) would explain all spectral hues between them, including the extraspectral purples between red and blue. The outer ring shows overlapping quantities of neighbor opponent processes. These tapering color bands show that neighboring unique hues can be blended in any proportions. Opposing hues  red vs. green, and yellow vs. blue  do not overlap in the outer circle: they cannot mix. A line through the outer ring indicates the relative proportions of two unique colors necessary to create the inner hue circle of color swatches. Hering's examples (in the lower left corner) show that a mixture of 25% unique blue and 75% unique red produces a crimson red, while a mixture of 75% blue and 25% red produces a blue violet, and a 50%/50% mixture produces violet. Other mixtures produce orange, yellow green and blue green to complete the circle. Although Hering did not describe a complete color system, his color writings suggested the basic geometry for the Swedish NCS color model. As explained in the next section, opponent contrasts have proven to be fundamental to color vision. So it is ironic that most of Hering's specific explanations of colorblindness and color perception have turned out to be incorrect, or the data he relied on flawed or incomplete. His concept of "visual substances" directly causing conscious sensations and working in chemical opponency, like acid and base, is wrong in several respects. The opponent contrasts that do underlie color vision are not anchored on the unique hues. Opponent contrasts can be identified in neural pathways only between the retina and visual cortex, not in brain areas associated with color recognition or color naming. Hering was an innovator who uncovered important and valid general principles despite a flawed interpretation of the facts. The Opponent Functions. For several decades after the publication of Hering's ideas, Hering and Helmholtz, and then their descendant partisans, disputed the theoretical mechanisms and research evidence for the trichromatic and opponent theories. The trichromatic theory and the opponent process theory were usually seen as incompatible explanations of color vision. By the middle of the 20th century, researchers had concluded that both theories were necessary to explain the physiological processes of color perception. These hybrid models were first suggested by Johannes von Kries and G.E. Müller in the 1890's and were definitively reformulated by Müller in 1930 as a zone theory of color vision. Zone theories derive the opponent dimensions from the trichromatic retinal responses by a step by step transformation or recoding across three or more stages or zones. In 1949 D.B. Judd specified Müller's physiological theory as testable equations based on cone fundamentals of the CIE standard observer. Today these opponent dimensions are the foundation for most modern color appearance models. In the 1950's by Leo Hurvich and Dorothea Jameson developed a quantitative hue cancellation method to measure the opponent functions by decomposing monochromatic hues into a mixture of two of the four unique hues. Their method uses the same color matching techniques developed to measure the cone fundamentals championed by Helmholz. In this procedure, either the viewers or the experimenters chose four wavelengths of light to match Hering's unique hues. (A mixture of "red" and "violet" wavelengths must be used to produce a unique red.) The intensity of each light was then adjusted so that equal parts of red and green matched the brightness of unique yellow, and equal parts of yellow and blue matched the brightness of unique green. Next, a fifth wavelength was chosen as the test color. Viewers used a light mixing apparatus to blend the test light with the two unique hues that were nearest complementary colors (opposite on the hue circle) to the test light, until the mixture produced a pure "white" light. This was repeated for test lights at regular intervals across the spectrum. Finally, the proportions (relative luminances) of the two unique hues necessary to cancel a third monochromatic light at each wavelength were combined as two chromatic response functions. Representative curves produced by two individual subjects are shown at right; theoretical curves, based on the CIE 10° standard observer, are shown below. As shown here, the horizontal zero line represents the balance between the two unique hues in a single opponent function. The distance of a curve above or below the line represents the relative quantity of each unique hue required to match (rather than cancel) the spectral hue at each wavelength (i.e., they are tetrachromatic color matching functions). The y/b opponent function is represented by the yellow/blue curve. The area where the yellow curve is above the horizontal line, with a maximum in "yellow green" wavelengths, indicates colors that appear to contain some yellow. The area where the blue curve is below the line, with a maximum in "blue violet", indicates hues that contain some blue. This y/b function contrasts the long and short wavelength ends of the spectrum. The r/g opponent function (red/green curve) codes for hues that appear to contain some red (the areas where the red curve is above the horizontal line, with peaks in "blue violet" and "scarlet" wavelengths) as opposed to hues that contain some green (the area where the green curve is below the line, with a maximum in "middle green"). This r/g function contrasts the middle wavelengths from both ends of the spectrum. Finally, Hurvich and Jameson adopted the photopic sensitivity function (gray curve) to represent the whiteness/blackness or w/k opponent function. Procedurally, they equated the w/k curve with the quantity of "white" light produced by the neutralizing mixture of spectral and complementary opponent hues. But this curve glosses over several problems. It does not account for the additivity failures in spectral mixtures, and blackness is not a color sensation created by isolated color mixtures  it arises from the luminance contrast between a color stimulus and the color area around it. Luminance perception is actually structured as a brightness/blackness (b/k) opponent dimension: white is its neutral value. What Are the Opponent Functions? On a previous page I mentioned that a few studies have analyzed the reflectance curves of a large number of color samples from the Munsell color system. When the correlations among all these reflectance profiles are statistically simplified, they result in three weighting functions (right) that reconstruct the original reflectance profiles with 95% to 99% accuracy, depending on the study. The pattern of peaks and crossings of these basis functions is extremely efficient in the sense that every surface color can be defined by a unique location in just three dimensions. These curves recognizably correspond to the general form of the three chromatic response functions: curve 1 is the w/k function, curve 2 is the y/b function, and curve 3 is the r/g function. There are discrepancies in the exact shape and crossover points of the curves (especially in function 1), but these discrepancies can be attributed to four factors: (1) reflectance curves are a physical specification of the color stimulus, not a perceptual specification via the cone fundamentals; (2) reflectance curves define the color independent of any light source, whereas the human opponent functions are optimized for chromatic adaptation along the dimensions of chromatic variation in the daylight phases; (3) the reflectance variations in the Munsell color samples are constrained to some degree by the limited number of pigments used to manufacture them; and (4) by far the largest proportion of natural surface colors are weakly chromatic and rather dark, which means the Munsell system contains a disproportionately large number of saturated and light valued colors. These issues aside, if we plot the size of the weights assigned to saturated Munsell hues on the second and third weighting functions, the color samples once again arrange themselves in a hue circle (right) with an accurate pairing of complementary hues  yellow green across from deep blue, and red across from blue green. This is persuasive evidence that, as we would expect, the perceptual structure of color vision is strongly tuned to the reflectance structure of natural surfaces. Transforming the trichromatic signals into the opponent functions would not be difficult for a neural network that could flexibly sum, difference and reweight the cone signals. For example, the diagram (right) shows the Hurvich and Jameson opponent functions (color) overlaid on curves derived as simple weighted sums of the linear, population weighted cone fundamentals (gray); numbers indicate the weight and sign applied to each cone output. Note the heavy weighting of the S cone outputs necessary to match the y/b opponent function estimated from hue cancellation experiments. This demonstrates the perceptual overweighting of S cones when we contrast their large contribution to the opponent dimensions with their sparse numbers among the much more common rod, L and M photoreceptor cells. All this implies that the wavelength locations of the unique hues are a byproduct of the opponent dimensions. The fact that we obtain the same hue circle and complementary color contrasts from two completely different analyses of the color space (the statistical analysis of reflectance profiles and the hue cancellation judgments of human subjects) implies that the orientation of the oppponent dimensions  and out of that orientation, the location of the unique hues  is of secondary importance. It's the overall structure of the hue circle that color vision must reproduce, not the orientation of the hue circle to specific "unique hue" compass points. There are in fact large individual differences in the identification of unique hues, which strongly suggests that the hues are not structurally basic to color vision. An exception may be the yellow balance between L and M cones, which is the least subjective of the four unique hues. If the M cone outputs are approximately doubled (to compensate for the 2 to 1 majority of L cones in the retina) then unique yellow is located at the null point (L2M = 0). The S cones cannot affect this balance because the S cone sensitivity in "yellow green" to "red" wavelengths (above 550 nm) is effectively zero, and because the S cone peak response (at 445 nm) is the complementary "violet blue" hue to unique yellow (between 565 nm to 575 nm, depending on the color temperature of the light used to define "white"). The S cones appear to desaturate yellow rather than shift its hue. Yellow around 570-575 nm is (not coincidentally) the direction both of color shifts in daylight chromaticity and of the yellow tint that accumulates in the lens with age. By anchoring the y/b contrast on this hue, the perceptual biases introduced by lens yellowing and the external constraints of natural light variations can be counterbalanced by a single dimension. If this is the critical alignment, the r/g dimension would adapt during development to provide an approximately independent contrast to the objectively anchored y/b dimension, which would produce the relatively larger individual differences in the choice of unique red and unique green. Finally, the spectral hues where the r/g or y/b opponent functions are in balance, as shown in the CIELUV chromaticity diagram (right), can be contrasted with the white point or balance point between two photoreceptor outputs that emerge in various types of colorblindness. In trichromatic vision two areas of reduced hue purity appear at around 490 nm ("cyan") and 570 nm ("yellow"), and the color white appears as a single point inside the chromaticity diagram. In tritanopia (missing S cone), the white line extends from 570 nm to 460 nm  in normal vision a very near visual complement to unique yellow. In protanopia (missing L cone), the white point changes into a confusion line across the chromaticity diagram from 494 nm ("cyan") to c494 nm: all colors on this line appear neutral or achromatic. In deuteranopia (missing M cone), the white line extends from 499 nm ("cyan") to c499 nm. Both confusion lines are close to the trichromatic unique red at c495 nm. This implies that unique red is a somewhat more reliable anchor for the r/g dimension, as seems verified by the much larger individual differences in the perception of unique green in comparison to unique yellow or red. Now we can examine the specific steps necessary to get from the Helmholtz cone fundamentals to the Hering opponent dimensions  the process described by 20th century zone theories. This problem can be explored with graphical data analysis, which has been used by multivariate statisticians for over a century. It lets us examine complex mathematics by means of pictures rather than numbers, and allows us to show complex transformations in simple geometrical terms. By making graphical adjustments to the color space  changing the length of color dimensions, rotating our view of the dimensions, adjusting the angle between dimensions  we can see the transformations from cones to colors as explicit sculptural steps. A Geometrical Color Standard. To start we require a graphical standard for the geometrical pattern we expect to find in the color appearance of color samples that have been correctly transformed from the light excitation produced in the cones. Since the 1920's, the most commonly used standard in color research has been the Munsell Color System. The Munsell system can be used to define colors that are perceived to be evenly spaced in hue and chroma across equal value (lightness or gray scale) differences. In addition, the Munsell hues 5R, 5Y, 5G and 5B approximately locate the Hering unique hues red, yellow, green and blue. The Munsell system arranges colors along equally spaced, radial hue angles and circular chroma levels from the achromatic point at each lightness level. This ideal geometry is most recognizable when viewed in the orientation shown in the diagram below, which displays all hues within the chroma range typical of artist's paints and at the two Munsell values 4 and 8. This pattern summarizes the expected relationships between color appearance and measurements of hue, chroma or lightness: chroma differences are equal across all chroma levels and for all hues; lines of constant hue are radial, straight and equally spaced around the hue circle; the "compass point" colors are Munsell hues 5Y, 10R, 5PB and 10BG; and these relationships are the same across all lightnesses. Another relationship, not visible in the diagram, is that each hue/chroma plane is perpendicular to the achromatic axis (like a wheel on an axle). To make these graphical comparisons, the color diagrams must represent height and width in equal scale units, turn the color space so that our view is directly down the achromatic axis (the gray scale), and place light yellow (5Y) at the top of the hue circle and red (5R) on the right. They also depend on the (certainly false) assumption that the Munsell color system distributes colors with perfect accuracy. Cone Excitation Space. The first stage in all zone theories corresponds to the transduction of light by the cone fundamentals, which define the relative amount of photoreceptor excitation produced by light of different wavelengths. The total stimulation is calculated by multiplying at each wavelength the L, M and S cone sensitivity by the color's spectral emittance curve, then adding the products across all wavelengths in the visible spectrum. This produces a triplet of cone excitations  Le, Me and Se  that produce the geometrically irregular and curved cone excitation space that was introduced earlier to describe the stimulation of the cones by monochromatic lights. It is not possible to measure cone excitations directly. Instead, a transformation function is applied to the XYZ tristimulus values to estimate the L, M and S values for each color sample. This space has very different characteristics when displayed in terms of surface colors, as shown below for Munsell color samples within the range typical of artists' paints (Munsell values 1 to 9 across chroma levels /2 to /12). In this view the cone excitation space is a cube, with the L, M and S cone excitations represented as the depth, horizontal and vertical distances from the back left corner (0); the cube is tilted forward slightly to make differences in the L direction easier to see. The color stimuli inhabit a small region of the total cubical space, forming a narrow, elliptical cone with apex at the origin (zero excitation in all three cones). This is the fundamental topology of human color vision. Hues are oriented with yellow downward (as yellows produce nearly zero stimulation in the S cones). A plot of the original XYZ values produces a nearly indistinguishable color distribution. Each value plane is almost perfectly flat, hue angles are all approximately straight and radial from the achromatic point, and complementary hues are radially opposite each other. The curvature of the color space produced by monochromatic color stimuli is not visible in surface colors. However, the distribution of colors displays some quirks, which are apparent when viewed from the side or above (diagram, right). The achromatic axis (white line, above), which intersects the pure gray value at each lightness, forms a rising diagonal across the space, while the luminosity function (green line, above) lies in the L,M plane. That is, the S cone contributes to chromaticity but not to luminance; whiteness is not the same as brightness. Each Munsell value plane is perpendicular to the L,M plane, so that the projections of all colors onto the plane form a series of lines across the luminosity function (gray lines, above), but the hue planes cross both the luminosity function and the achromatic axis at oblique angles. Next we orient the colors at values 4 and 8 to match the Munsell ideal standard (above). To do this, the space must be turned or rotated so that the achromatic axis is aligned with the direction of view, then turned on its head to place yellow at the top, as shown below. The amount of rotation depends on how the cone fundamentals are weighted (equivalently, how the white point is defined), but approximately a 45° turn around the S dimension and then a 30° tilt downward around the new LM dimension will bring all the gray points (wp) together over the origin. In this orientation, the fundamental two part geometry of the cone excitation space is visible: the L+M excitations define the horizontal dimension, and the S axis the vertical dimension. (2) At lighter values, larger increments in cone excitation are necessary to produce equal chroma changes, as shown by the increased diameter of the hue plane and of the innermost (chroma = 2) ring at value 8 compared to value 4. (3) The hue/chroma planes are not circular but elliptical: the excitation distances between chroma values are much smaller in the L and M direction than in the S direction. (4) Hue angles are not equally spaced; instead hue differences are much smaller among some hues (yellows, oranges and blues) than others (magentas and greens). (5) Each hue/chroma plane of colors having equal lightness or Munsell value is not perpendicular to the luminosity dimension or to the achromatic axis. Note that the distribution of surface colors in the cone excitation space is far more regular than the distribution of monochromatic lights. Color vision is adapted to perceive surface colors accurately, not spectral hues or rainbows. Cone Contrast Space. The next step in color vision actually embraces several color transformations. In modern color appearance models and chromaticity diagrams, cone excitations must be adapted through response compression, the definition of preliminary opponent dimensions, and a complete separation of the luminosity and chromaticity dimensions. Physiological and psychophysical studies over the past few decades have clarified additional early transformations, in particular the recoding and normalization of cone outputs as a cone contrast space anchored on the background or adaptation values. Response Compression. The photoreceptor outputs actually signal changes in light in relation to the baseline cell excitation. Photoreceptors do not signal an absolute level of light energy but a relative or proportional difference or contrast to the amount of light that has come before. Thus, the cone responses already include some part of luminance adaptation to the average luminance, and chromatic adaptation to the average chromaticity, of the visual field. Further adjustments are also made at later stages of the visual process. These contrast values can be either positive or negative; the null point or origin of the space represents the La, Ma and Sa values. The most important feature of these contrast or change ratios is that they constitute a comparison between two different stimuli (the color and the adaptation background), which defines a Weber fraction. Fechner's Law states that a stimulus contrast will produce an equal perceived color contrast whenever the color stimulus is a constant proportional difference (ΔL) from the baseline stimulus (La). This contrast space disguises the absolute color and brightness of the visual field (because all adaptation states are set equal to zero), but standard practice is to use the white point to represent adaptation to an achromatic background perceived as "white" or "gray" (for surface colors) at a specific luminance level. A thornier problem is that the dimensions of the space represent relative increases or decreases in cone stimulation, which are different for different observers, adaptation backgrounds, spatial or temporal variations in the stimulus, or amount of color contrast. A common procedure is to make each dimension proportional to the maximum possible stimulation possible in each situation. In modern color appearance models, which deal directly with stimulus quantities (in the form of colorimetric tristimulus values) rather than cone excitations, the response compression is defined as a power transformation or exponent applied to the tristimulus values before any other transformations are made. As shown above, the compression exponent (0.33) has a more complex effect on the hue/chroma planes. It gives the chroma rings approximately equal diameter at each lightness level, and somewhat reduces the elliptical shape of the chroma contours, primarily by changing the relative proportions along the vertical (S cone) dimension. This changes the geometrical distribution of colors from an elliptical cone to an elliptical cylinder; but it increases the rightward tilt of the chroma boundaries. Note that the chroma spacing increases substantially in yellow hues at all lightness levels, primarily due to the exponent effect on the extremely small S cone values. This implies that all cones paradoxically have their largest relative impact on color discrimination (chroma and hue differences) when their signals are close to zero. The same effect is visible in the nearly vertical lightness slope of the Y function at near zero luminance factor (diagram, right). Postreceptor Opponent Contrasts. The cone contrast space defined by the LΔ, MΔ and SΔ provides the framework for the definition of a preliminary opponent contrasts of the trichromatic outputs. The version proposed in 1984 by Derrington, Krauskopf & Lennie (known as the DKL opponent space) has been especially influential in the neurophysiological stream of color vision research. It is based on an isoluminant chromaticity diagram devised by Donald MacLeod and Robert Boynton (diagram, right). This chromaticity space standardizes all values on the luminance Lum (L+M) response and gives all three cone responses equal weight. Some color spaces double the M response to the red/green contrast (L2M). This procedure also forces a new distinction between the luminosity and achromatic axes. If the Lum (L+M) dimension includes any S output, then a second rotation of about 26° around the LM dimension has been applied to align the achromatic points with the direction of view. This defines a whiteness/blackness or lightness induction dimension (W). The innovations here are that the cone excitations have been combined according to specific proportions that establish contrast, priority and independence among the cone signals; and that four distinct quantities  Lum, W, LM and LumS are in play. This effectively weights the L cone output to about 2 times the M output and over 50 times the S output in the definition of the whiteness L+M+S dimension. Called an oblique rotation, it orients the hue/chroma planes perpendicular to the achromatic axis, and aligns the luminosity and achromatic dimensions along the LM dimension: saturated red and green are roughly equal in lightness. In either space, a residual correlation between lightness and chromaticity remains along the L+MS (YZ) dimension, visible above as the leaning shape of the color distribution. These are not removed, because it corresponds to the perceptual fact that dark purples are much more saturated than dark blue greens, and dark yellows and light blue violets are not strongly saturated. Perceptual Opponent Space. The third step in zone theories stipulates that the separate cone contrasts are combined into perceptual opponent dimensions. These dimensions are presumed to describe the conscious structure of color perception  in other words, the distribution of colors in the Munsell color system. In modern color models this stage constitutes a final adjustment of the postreceptor opponent dimensions (the "preliminary" ab dimensions in CIECAM). Where have the postreceptor opponent dimensions taken us? After the cone excitations are response compressed, rotated, made perpendicular to and normalized on the maximum value on the achromatic (Wp) dimension, the spectrum locus appears as shown (diagram, right). The opponent dimensions place "blue green" (495 nm) on the L+MS null line and "green yellow" (570 nm) on the LM null line; these are the commonly ascribed balance points for the yellow/blue and red/green opponent contrasts. The large weights given to the LM contrast are necessary to overcome the narrow elliptical shape of the color space. The diagram (right) shows the spectral profile of the chromatic postreceptor opponent functions. The recognition features are the absence of positive "violet" hue coefficients on the LM curve, and the very large negative "violet" hue coefficients on the L+MS curve. The diagram below shows the hue/chroma distribution of surface colors. The L+MS null line is placed at an exquisite chartreuse (yellow green) and violet (approximately Munsell 5GY and 2.5P). The LM null line is placed at blue green and magenta, at Munsell 2.5BG and 10RP.  A pronounced elliptical distortion remains in the chroma rings: the blue greens are too compressed in comparison to the yellows, and the hue angles are not equally spaced around the hue circle (compressed in yellow and blue, expanded in green and magenta).  The elliptical distortion is itself distorted in the direction of yellow green and violet red, and this distortion increases at higher chroma levels, which causes the near neutral chroma rings to appear roughly elliptical but the saturated chroma rings to assume a wedge shape.  Yellows with a distinctly green content are on the "red" side, and blues with a pronounced red content are on the "green" side, of the LM (red/green) null line. (That is, the vertical "compass points" in the geometrical standard are rotated clockwise), However, this cannot be corrected by rotation, as the horizontal "compass points" (10R and 7.5BG) are approximately correct.  The chroma intervals are not equivalent at different lightness levels; comparing Munsell values 4 and 8, the disparity is especially large in yellows and blues. Necessary Additional Transformations. These four problems remain the most significant obstacles to accurate color scaling of color samples viewed in isolation (that is, colors that are not significantly affected by color context). They typically require additional transformations in quantitative color models that do not, as yet, have a clear connection to the neural machinery of color vision  we can't explain why they are necessary.  separation of the achromatic dimension (or lightness, J) from the luminosity dimension (or brightness, Q) produced by a decrease in the relative S cone contribution. In other words, the CIECAM color space depends on the extensive redistribution of the S cone outputs (equivalently, the effect of short wavelength light) in the definition of the opponent dimensions. A similar redistribution is silently effected in CIELAB by the fact that the "red" (X) and "green" (Y) tristimulus values include a substantial "violet" content. The diagram (right) shows the spectrum locus and hue coefficients in CIECAM. The key differences with the postreceptor opponent functions are primarily in the "yellow" and extraspectral ("red" and "violet") hues, and in the sharply curtailed involute of the "violet" end of the curve. The recognition features are the positive hue coeffients (and second null point) on the aC (LM) dimension in "violet" wavelengths  which is small in CIECAM but much larger in, for example, the Hurvich & Jameson perceptual opponent dimensions or in CIELAB; and the relatively small negative values for "violet" hue coefficients on the bC (L+MS) dimension. The distribution of surface colors (below) shows a much more circular outline in the chroma rings, and better placement of the yellow and blue violet colors in relation to the vertical null line. However, there is still significant irregularity in the chroma contours, visible as the "wedge" exaggeration of chroma distances in the yellow green and red directions, and in the crowded hue spacing in yellow greens, reds and blue greens and the exaggerated hue spacing in greens. At this point, the divergence of the color distribution from the ideal, perfectly circular distribution runs up against a variety of methodological issues. One is that the accuracy of Munsell scaling has been questioned; for example, it is generally agreed that the Munsell hue spacing across green colors is too large, and the chroma scaling seems to be inconsistent across hues and values. Nevertheless, the problem with the chroma scaling likely represents a genuine aspect of color vision. We get a better picture of this problem if look first at the raw data: the original X,Z tristimulus values in a single hue/chroma plane, with the X dimension centered on Y and expanded to produce a near circular ring at chroma 6. The geometrical problem appears more clearly in the deviation of each hue sample from the circular placement in its chroma level. This produces the diagram below; value 6 is used because it is the only hue/chroma plane in Munsell that covers all hue slices out to chroma 14. The undulating curve indicates that the chroma scaling is too large in the direction of yellow and blue, and too small in the crosswise direction, toward green and violet, and that the deviations grow larger as chroma increases. The orange curve shows that a similar "problem" persists in CIECAM, although I can't say how much of this is in CIECAM and how much is in Munsell. The hues where the maximum deviation occurs in each quadrant shift slightly as the chroma increases, but the basic pattern is relatively stable across different lightness levels, different compression exponents (when applied uniformly to all colors), and different locations of the achromatic center. The pattern is primarily determined by the cone fundamentals or color matching functions used to define the cone excitation space, and by the numerical definition of the opponent dimensions. The axes of the deviations are also not exactly perpendicular, as shown in the diagram (right). The correction for these deviations probably requires information about color appearance across a wider range of contrast and luminance levels. There are at least three different problems to solve. The first is the increased, eventually straight line compression of chroma spacing along the zero S (=Z) line for hues between 7.5G to 7.5YR at chroma above 8. This is clearly visible as the flat chroma boundary across the yellow part of the color distribution in the x,z and opponent spaces (diagrams above and right). The second problem is the spike of inflated b+ chroma values, which is due to the peak values of the Lum (L+M) sum where they cannot be moderated by subtracting S values near zero. The effect disappears across the yellow orange and orange hues because these colors are substantially less luminous. This implies a smaller exponent (a larger chroma deduction) across the yellow green hues. The third variation, the gm+ and g+m deviations, suggests a third exponent operating in relation to the sign of both opponent dimensions: the exponent produces a relatively smaller compression for hues where the sign product of the ab dimensions is negative (greens or violets), and a higher compression when the sign product is positive (oranges and blues). In a discussion below, I suggest that a green/magenta opponent function seems implicated in luminance adaptation to color perception. Perhaps the most significant themes to emerge in this discussion of undefined additional corrections is the regulatory importance of the S cones in the specification of an opponent color space, and the complex interplay of different compression, rotation and normalizing steps necessary to reach an approximately circular scaling of perceived chroma in consciously reported color appearance. As mentioned earlier, many of the issues I've described have been minimized in earlier color models by direct use of XYZ tristimulus values, because these already redistribute the S ("violet") content so that the "red" (X) dimension is actually a magenta, orient the "red" and "violet" dimensions perpendicular to the luminosity (Y) dimension (that is, X and Z are defined to have zero luminance), and the exponent compressed dimensions form nearly circular chroma rings. But this means that many of the necessary transformation steps are "precooked" into the XYZ values. To apply more sophisticated adjustments, as in CIECAM, the XYZ values must be "uncooked" (transformed or rotated) to get back to the (theoretically) primitive LMS values. In fact, nearly all modern definitions of the L, M and S cone fundamentals are rotated and rescaled versions of the XYZ values. Starting from the LMS values displays the essential information processing steps more clearly, and shows that color vision is a tightly integrated, precisely balanced process. It also confirms that current color models do not yet describe it accurately. The various aysmmetries in color space and color perception described in the previous sections appear across all aspects of color. In this section we explore how they affect color discrimination on the dimensions of lightness, hue and chroma.  What is the smallest stimulus difference we can perceive on each of the three colormaking attributes?  Does discrimination ability change as the physical properties or intensity of the stimulus changes?  How does change on one colormaking attribute affect color appearance on another colormaking attribute? All these questions concern related colors  one color seen in contrast to beside another. As a bridge between the realm of color discrimination and the colorimetric definitions of color matching, I open each discrimination section with the color geometry predicted by standard chromaticity diagrams, which describe unrelated colors or colors perceived in isolation. The "Just Noticeable Difference". For starters we need a method of measuring discrimination that can apply to any color attribute we can manipulate by changing a physical stimulus. The metric discovered in 19th century psychophysics and used frequently since then is the just noticeable difference or jnd. As shown at right, a stimulus is presented at a starting quantity Q of a stimulus attribute (luminance, chromaticity, or hue for colors). Once the viewer is adapted to this stimulus, the attribute is increased by varying amounts and each time the subject is asked, yes or no, if there is a difference in the stimulus. After repeated trials the increment T that produces a perceptible difference is identified, or the increment that produces a correct response 75% of the time is used to compensate for the effects of guessing. This defines a quantity of stimulus change T, known as the difference threshold or 1 jnd. When the starting quantity is the stimulus zero value (complete absence of the stimulus), then the first jnd value T is called the absolute threshold Q0. This is the minimum stimulus quantity necessary to produce any sensation. The process can be repeated by using the previous value Q as the new starting value, increasing the stimulus intensity again until a new difference appears, and taking this new value of T as a difference threshold at that stimlus intensity. By repeating this procedure across incremental increases in the stimulus quantity, the subjective sensation produced by any physical attribute can be measured off using the "yardstick" of the just noticeable difference. where b is used to fit the stimulus units to a practical perceptual scale. Similar power functions occur in all sensory domains  vision, taste, hearing, touch, smell, pain and muscular contraction (sensations of weight or effort)  although the exponent in each domain is different. In fact, log or power functions similar to Fechner's Law or Steven's law are used in many scales related to energetic quantities  stellar luminances in magnitude, sound in decibels, earthquakes on the Richter scale, ion ratios on the pH scale, and so on. where R is the response as a proportion of the maximum possible response Rmax, L is the stimulus luminance (or retinal illuminance), σ50 is the luminance value that produces a 50% response (the half saturation value), and n is the response compression exponent (usually around 0.70). (Zero is the assumed minimum response.) The implications of this function are discussed in the section on luminance adaptation mechanisms. The Power Function in Lightness. What is the effect of the Weber fraction on perception? The relationship between the perceived lightness of a surface color and its reflectance or luminance factor (luminance as a proportion of the luminance of an ideal "white" surface) shows the perceptual geometry very clearly. This power function or nonlinear psychophysical relationship between lightness and relative luminance is approximately a square root function for reflectances above ~7% (that is, 1/e is about 0.43). The curve for brightness discrimination is approximately the cube root (1/e = 0.33) of absolute luminance. Underlying these sensory power functions is the common sensory property of response compression. Fundamentally, response compression represents a compromise between the physical limitations of an organism and the enormous range of a real world stimulus. In effect, the organism experiences an increase in the stimulus as a sensory change proportional to the remaining sensory response  which becomes smaller as the sensation approaches its physiological upper limit. The graphic (right) illustrates the perceptual effect of response compression in lightness. Equal increments of the stimulus intensity become less and less perceptually potent as the intensity of the stimulus increases, just as a single lightbulb adds considerably to the illumination of a candlelit room but in broad daylight makes no impact at all. To raise lightness or brightness by equal perceptual amounts, the luminance or reflectance must be raised by a greater absolute amount at each step. Thus an equal interval luminance or reflectance scale (equal Lum) produces a brightness/lightness scale (B/L) skewed toward lighter values, while an equal interval brightness/lightness scale (equal B/L) arises from a reflectance or luminance distribution (Lum) skewed toward lower values. The effect is to divide the lightness distribution into two parts  light grays and dark grays  with the proportionately best lightness discrimination in the light grays (medium to high luminances). "Less" and "more" luminance is always relative to our light adaptation around an average luminance (which is usually a 19% luminance factor for the "middle gray" used in graphic arts but is 10% to 13% for the "gray" luminance used to meter photographic exposures). For illumination levels above a few lux the subjective effects of response compression are remarkably consistent. The sensory response compression displayed in psychophysical power functions is the single most important asymmetry in color vision. Its effect throughout the visual system is to create curvatures or nonlinearities in stimulus intensities across steps of perceptual difference that appear to us as evenly spaced "just noticeable differences". Luminance Discrimination. Response compression shows that increasing quantities of light produce decreasing sensory changes as the light intensity becomes very high. However, this tradeoff is not consistent across all luminance levels. Instead, the Weber fraction or "constant proportion" between the starting luminance and a just visible increase in luminance varies with the average light intensity. In fact, changes in the Weber fraction are apparent just within the range of luminances that characterize surface reflectances (diagram, right). The first jnd below a pure "white" surface represents about a 2.6% decrease in luminance; but at low luminances (low reflectances, or very dark surfaces) the incremental change in luminance rises to 10% and above. This imposes a hard "floor" or minimum sensitivity on lightness gradations, which we do not experience because nearly all surfaces have reflectances greater than 5%. If we consider difference thresholds in the brightness of two lights viewed side by side, in the Weber fraction (ΔL/L) similarly changes across luminance levels from .0001 to 10,000 cd/m2 (equivalent to light intensity or illuminance on a white surface of about .0003 to 30,000 lux), as shown below. At scotopic light levels (below 0.005 cd/m2) a barely visible increase in luminance must be 23% or more greater than the starting luminance. At photopic levels above 100 cd/m2 the sensitivity is much greater, and luminance need only increase by as little as 1.3% to produce a visible difference. The kink in the curve at about 0.005 cd/m2 is due to the different response compressions in cone and rod photoreceptors. It indicates that the cone mediated luminance response persists to lower light levels than the cone mediated chromatic response, which is usually said to disappear at around 0.1 cd/m2 or 0.02 lux. On either side of this kink the Weber fraction shifts as two different exponential functions, one for scotopic vision, and the other for mesopic vision where both rods and cones are active. At very low light intensities, it is estimated that the eye when completely dark adapted can perceive one or a few photons at a time, so the visual threshold is very close to the physical zero value of the stimulus. Very high light intensities can completely saturate the photopigments in the eye and make any changes in intensity impossible to see. This saturation occurs at luminance levels somewhere above 100,000 cd/m2  the exact value depends on the duration of the exposure  but the chart shows visual sensitivity already starts to decline above 1000 cd/m2. At peak sensitivity the eye still responds to a limited luminance range, roughly 1:100 around any specific luminance adaptation value. Photometric or lightness scales are usually divided into 100 units because, at photopic light levels, the eye is able to discriminate at most many steps in surface reflectance when the eye is adapted to the "white" luminance. For example, the illustration shows 50 luminance steps, from black to white, that should appear perceptually equal across the entire range. (The contrasts you are able to see depend on the brightness and contrast settings on your computer monitor.) Note that the differences between adjacent steps are barely visible with edge enhancement, and become indistinguishable when separated by a black line. Now let's step outside the visual range and look at the scope of vision across all light levels. the graph shows the same compression function across familiar illumination levels. What may be unexpected, and is delightful, about the comprehensive light sensitivity curve is that the visual range defines similar compression functions at different adaptation states. Two sections of the illuminance curve, converted to the luminances of a reflecting "white" surface, are shown as examples: one at twilight adaptation, the other at late afternoon adaptation. The result of this response uniformity is that we see the same relative lightness values attached to the corresponding reflectance factors, even though the level of illumination and the absolute differences in surface luminances may have significantly changed. The interior proportions of "light space" remain perceptually constant  the ultimate benefit of Weber's law. Finally, the sensitivity of the eye to luminance or lightness changes depends on the apparent size of the color area. Contrast sensitivity peaks for surface areas subtending a visual angle of about 0.2° (the apparent width of a #2 pencil seen from 7 feet, or less than half the width of the full moon). Sensitivity declines slightly but remains good for areas of much smaller size (such as the lines forming the letters of this page), and more rapidly for visual areas subtending 1° or more (a USA dime at 3 feet). Hue Discrimination. Consider next the ability of normal trichromats to see the difference between two similar hues, a test of hue discrimination. As a template of the hue discrimination we expect to find, the diagram below shows the hue angle distance between adjacent wavelengths at the spectrum locus, as measured at the white point, using three different chromaticity diagrams. The log hue angle difference is used because the hue angle is made smaller by increased chroma (distance from the white point), and chroma shows response compression as chroma increases. Again, the chromaticity diagrams represent unrelated colors as produced entirely by the L, M and S cone outputs. So they represent the hypothesis that the cone outputs define our hue discrimination abilities. If actual hue discrimination does not match these curves, then hue discrimination must be affected by additional visual processes. There is fair agreement among the three predictions. All suggest two points of peak hue discrimination, around 480 nm ("blue") and 570 nm ("yellow", which is more pronounced in the foveal model), somewhat diminished hue discrimination in "green" wavelengths, and steadily weakening discrimination at the spectrum ends, especially in "red" wavelengths. The result is approximately a W shaped function with higher vertical bars at either end than in the middle. These curves are hard to visualize as a color circle, so the diagram below presents the CIELUV predicted spectral hue angles projected to an equal radius (as shown below for the spectral location of "green" at 540 nm). This shows the predicted perceived spacing of spectral hues as the radial distance between hue markers. The two areas of maximum hue discrimination (at 570 nm and 480 nm) are represented by widely spaced spectral markers, and the areas of poor sensitivity ("blue violet," "green" and "red") by crowded or overlapping markers. The lowest "green" sensitivity (at middle "green", 520 nm) is approximately midway between the "yellow" and "cyan" peaks. Now here is observed hue discrimination performance, measured as the minimum wavelength difference necessary to make two monochromatic lights, presented one above another at equal luminance, appear just visibly different. The three curves represent hue discrimination measured at three luminance levels (in trolands) for three stimulus sizes (angular widths). These curves do not correspond very well to the curves predicted from chromaticity diagrams. Although the experiments show the distinctive W shaped curve identified in CIELUV (above), the "basins" of high hue discrimination are much broader, and the effective wavelength change of 1 or 2 nanometers is smaller, than predicted. Roughly double the hue change (4 nanometers or more) is required to produce a visible difference in middle "green", much less than the predicted 10:1 difference between "yellow" and "green" acuity. The decline in hue discrimination at the spectrum extremes is also more extreme, and closer to "orange" hues, than predicted. Finally, actual hue discrimination is very sensitive to stimulus size and brightness, a topic explored in a later page. However, a generally very good match is obtained in a calculation from the absolute change between two spectral wavelengths in scores on the y/b, r/g and w/k opponent functions combined (right). The log of this absolute change represents the "orange" and "cyan" basins approximately correctly, gets the two peaks of poor "blue" and "green" discrimination, and also catches the third area of good hue discrimination around 420 nm. There are a few details where the opponent dimensions diverge from the experimentally observed hue discrimination curves. But the overall fit is close enough to suggest that the opponent dimensions, not the cone fundamentals, define the geometry of hue discrimination. In the previous section I explained that the unique hues do not define the opponent dimensions. A logical corollary is that the unique hues do not explain hue discrimination, which is easy enough to test. First the opponent dimensions must be transformed to show each hue as a proportional mixture of two unique hues, as Hering required. (This also minimizes the effect of changing brightness or saturation in the monochromatic lights.) After this adjustment, the opponent functions appear as shown at right, and their values are called hue coefficients or hue proportions. This shows that equal mixtures of unique yellow and unique green, or unique yellow and unique red, are quite close to unique yellow, rather than halfway toward the other hues. The unequal spacing occurs because the results are shown along a nanometer scale, which corresponds to the visual spacing of hues in a diffraction grid spectrum. This is remedied by respacing the spectrum to correspond to equal changes on the hue coefficients (the proportional mixtures of two unique hues). As a result, some parts of the spectrum are perceptually expanded while others are greatly compressed (diagram below). This new spacing is hue discrimination acuity predicted from the unique hues. It's intriguing that the predicted hue discrimination curves from hue coefficients and CIELUV are almost indistinguishable. Again the best acuity is located around 485 nm and 573 nm, with worst acuity at around 520 nm and at the spectrum extremes. The proportional change in hue discrimination from best to worst is too large (except for the spectrum ends), and the third area of acuity at around 420 nm is missed completely. However, hue flexes and shifts in response to viewing or contextual factors, including color luminance, chroma, color contrast, chromatic adaptation and cognitive interpretation of the scene. It is reasonable to expect that hue discrimination cannot be explained by a single zone or mechanism in color vision  though the opponent dimensions, provided they include luminance (the w/k contrast), do an excellent job. Hue Purity Discrimination. As explained in the introduction to chromaticity diagrams, hue purity (chroma or saturation) can be defined as the distance on a chromaticity diagram between a color and the white point, when all colors are standardized to have the same brightness. The diagram below shows chroma measured in chromaticity diagrams from an equal energy white point to the spectrum locus at each spectral wavelength. As before, the curves are based on three different chromaticity diagrams, expressed in log values because chroma shows response compression as chroma increases. The underlying measurement units were different across the three chromaticity diagrams, so all have been normalized to the same maximum and minimum values (which occur in the "violet" and "yellow" wavelengths). These curves represent unrelated colors as produced entirely by the L, M and S cone outputs. So they represent the hypothesis that cone outputs alone define our chroma discrimination. If actual chroma discrimination does not match these curves, then it must be affected by additional visual processes. The first point to note is the poor agreement among the three chromaticity diagrams. All (especially the foveal model) suggest a single minimum value at around 570 nm ("yellow"), where the spectrum locus comes closest to the white point. Both the CIELUV and 10° curves indicate a second chroma minimum or inflection in the curve at around 483 nm ("cyan"), and reduced "green" saturation in between. All models show elevated chroma at both spectrum ends, but the wide field (10°) and CIELUV curves indicate "violet" chroma is higher.  measure the minimum quantity of monochromatic light necessary to produce a just noticeable tint in white light (a lot of "yellow", very little "blue violet"). These tests (especially the last) are analogous to the painter's tinting test and clearly illustrate the overweighting of B cones in color vision. The geometry below shows the quantity of pure hue necessary to tint a pure "white" light, or the tinting strength of monochromatic light at constant luminance. These curves show reasonable agreement with the foveal (2°) chromaticity diagram, implying that the overlap in cone sensitivity curves primarily determines our chromatic sensitivity (or that Priest and Brickwedde used a foveal presentation of the color stimuli). The data allow some quantitative conclusions: a 15:1 mixture of "white" and monochromatic "yellow" light is necessary to produce a just noticeable tint in white, but for "red" light the mixture ratio is around 170:1, and for "violet" light it may go as high as 1000:1! By this measure, monochromatic "violet" light has over 60 times the tinting strength of "yellow" light. These curves only show the first chromaticity step from the white point, not the overall geometry of chromatic intensity across the entire range of saturation values. They also do not indicate the response in surface colors, which are determined by more complex perceptual processes. In surface colors, any simple relationship to cone outputs is lost. As a simple illustration, the diagram (right) plots total chromaticity signal (computed as the ratio between the L, M and S chromatic and achromatic responses at each lightness, summed across all three cones) against the CIECAM measure of saturation for five cardinal Munsell hues (5Y, 5R, 5P, 5B and 5G), across the physically possible chroma range at Munsell values 4, 6 and 8, into equal area cone fundamentals. The cone outputs were derived as the transformed tristimulus values for all colors. The basic feature is a relatively linear response between saturation and cone excitation across the red, yellow and green hues, but substantial response compression in the blue and violet hues. The cone responses also show a very large initial increment in saturation in relation to the chromatic signal, a jump that is too large to be traced in detail by the Munsell chroma intervals. This indicates that the visual system is especially sensitive to small chroma differences from the achromatic point, and becomes relatively less sensitive to chromatic differences among strongly saturated colors. Finally, note that the basic function within each hue is invariant across lightness levels, as we would expect of saturation. A major perceptual factor affecting the relationship between cone excitation and perceived saturation is luminance contrast. Ralph Evans used the concept of brilliance to integrate contrast effects across both self luminous and surface colors. Brilliance comprises four qualitatively distinct and mutually exclusive color perceptions  black, grayed (appearing as a surface), fluorent (appearing as a glowing surface) and self luminous (appearing as a light)  as shown in the schematic. Evans presented viewers a donut shaped field of achromatic (white) light, 10° wide and at a constant, moderate luminance (320 cd/m2), then projected increasing amounts of highly chromatic, filtered light into the 2° dark central area. First the area appeared black; then, as the luminance of the colored light was increased, the shadow changed at threshold from black to a dark, grayed (dull) surface color. As the color luminance increased, the color became more saturated (less gray) until a zero grayness point of maximum hue purity was reached, at a luminance well below the luminance of white. At still higher luminances the color became fluorent or glowing, ambiguously between a surface color and a self luminous color. Finally, at a luminance roughly twice the "white" surround, the fluorent effect abruptly disappeared and the color appeared unambiguously as a light. Besides illustrating the importance of luminance contrast to the perception of saturation, and to the perception of surface colors as opposed to light colors, Evans's method identifies the luminance ratio between the color and the white surround necessary to produce the perception of fluorence. In effect, the "tinting strength" of different hues is now defined as the power to overcome a luminance contrast. Evans's method identifies two saturation minimum values at around 490 nm and 575 nm and a suppressed area of "green" chromatic strength between them (as predicted by CIELUV), but shows a lower "red" saturation through the end of the spectrum (roughly 10 times stronger than "yellow" light), and an extremely high chromatic strength in "violet" light, which here has roughly 150 times the strength of "yellow" light! This zero grayness function is similar to the maximum hue purity or chromatic strength judged by other methods, but again it is not predicted well from the chromaticity diagrams. However, it is very closely matched by the log (response compressed) sum of the absolute values of the y/b and r/g functions at each wavelength, divided by the w/k function to represent the luminance contrast ratio (right). The fit is very close, and clearly indicates that the chromatic intensity due to luminance contrast is defined by the opponent functions. To summarize: all predicted and observed hue purity or "tinting strength" geometries show a minimum chromatic strength around 570 nm ("yellow") and maximum in the "violet" wavelengths. Otherwise, the characteristics of hue purity depend on how it is measured. The evidence suggests that chromatic intensity conflates two perceptual contrasts: (1) the chromaticity difference between the color and a white of equal luminance (white as a chromaticity standard), and (2) the luminance difference between the color and its surround (white as a luminance standard). The same "brilliance" percept is applied by the visual system to two different definitions of a "white" contrast. Perceived chromatic intensity may be determined by the cone fundamentals or by the opponent dimensions or some combination of the two, depending on the viewing context. The light mixture tinting curves are approximately predicted by the 10° or CIELUV chromaticity distances, but Evans's luminance contrast or zero grayness curve is closely predicted by the opponent functions. In particular, the cone based chromaticities dominate the saturation perception of isolated colored lights, while the opponent dimensions dominate saturation perception in related surface colors. As explained on the previous page, there are many definitions of hue purity, each definition linked to a different perceptual measure, each measure producing a different perceptual geometry. It is probably misleading to define hue purity as a single perceptual attribute or contextual judgment. Color Attributes Combined. So far the geometry of the colormaking attributes has been described in terms of differences in the physical stimulus attributes  luminance and wavelength in particular. This section considers the geometry created when one colormaking attribute is described or measured in relation to another. Brightness and Saturation. The sibling relationship between brightness and hue purity, described on a previous page, was encountered in the 19th century with a research technique called heterochromatic brightness matching. In this task, viewers matched the apparent brightness of two different wavelengths of monochromatic light, or of a spectral light and a standard white light, to determine the photopic luminous efficiency function. It turns out this task is difficult to do, and delivers unreliable results, because the intense saturation of spectral hues is perceived as part of the color's luminance. This brightness increased by saturation, which grows stronger as saturation increases, is called the Helmholtz-Kohlrausch effect. It might better be called chromatic luminance, since "white" or achromatic luminance is the standard of comparison. It appears in both self luminous and surface colors, although it is most pronounced in spectral lights. The diagram shows the ratio of "white" luminance to color luminance as actually measured for partially desaturated hues, and as projected to the spectrum locus by a straight line. (Tests within single hues show the HK effect increases approximately linearly with distance from the white point.) This shows that the HK effect is stronger in some hues than in others: (1) nearly absent in "yellow green" to "deep yellow" hues, (2) moderately high in "orange", "green", "cyan" and "blue" wavelengths, and (3) very high in extreme "orange red", "blue violet" hues and their extraspectral ("violet" and "red violet") mixtures. In addition, the HK effect varies significantly across viewers, quite strong in some and nearly nonexistent in others. How large is chromatic luminance contribution to spectral hues? The diagram shows the increase in the luminance of a "white" color area necessary to match the brightness of a 10° chromatic color area at a constant (mesopic) luminance of 20 cd/m2. The smallest increase is for spectral "greenish yellow" "yellow" light (565 to 575 nm), where chromatic luminance is equal to about 2 to 3 cd/m2 of "white" luminance; the largest is for extraspectral "purple" (c541 nm), where the increase is almost 27 cd/m2. For hues from "violet" to "green", saturation seems to add about 8 to 14 cd/m2 to spectral hues. For surface colors, where the lightness of a colored tile must be matched to a gray tile under the same illumination, the HK effect seems somewhat smaller than for lights and is more equal around the hue circle; it is also dependent on the chromaticity of the light source. Under daylight illumination, a comprehensive sample of moderately chromatic colored tiles produced an average lightness increase of L* = 7.1 for tiles with an average CIELAB chroma of C = 45. Chromatic luminance causes substantial additivity failures in brightness matching. For example, if "blue" and "yellow" monochromatic lights are separately matched to a "white" light, the mixture of the "blue" and "yellow" lights is substantially dimmer than the "white" light at double luminance. This violates the basic algebraic rules of trichromatic theory. The size of the additivity failure depends on the dominant wavelength of the two lights in the mixture. This appears in the following procedure. The brightnesses of different monochromatic lights are matched to a "white" standard of constant luminance (which in many studies has been an incandescent source with an "orange" CCT of ~2800°K). Then the luminance of the "white" light is doubled, each monochromatic light is mixed in turn with a constant "green" (520 nm), and the brightnesses of the mixture and white light are compared again. For most viewers, the mixture of "yellow" and "green" lights produces the same brightness as the doubled "white" standard. However, the mixture of "violet" and "green" creates a "cyan" that is too bright (enhancement), so the "violet" luminance must be reduced by 40% to restore the brightness match. The "yellow" mixture of "red" and "green" is much too dim (cancellation), so the "red" luminance must be increased by 90%. Though not shown in the diagram, mixtures of "violet" and "white" [orange?] also produce cancellation, while mixtures of "red" and "violet" are strongly enhanced. In a related procedure, spectral lights are adjusted to match a "white" standard, then each colored light is mixed in turn with the "white" light, and the mixture brightness compared to a "white" light at double the original luminance. This produces a similar curve, but with a slightly greater cancellation in "cyan" wavelengths. It also shows that lights around 570 nm and 470 nm (unique yellow and unique blue) have no enhancing or canceling effect on the "white" [orange?] light. These additivity failures explain several puzzling features of color vision. The cancellation produced by mixtures of "red" and "green" light, which is very strong no matter how additivity is measured, accentuates the r/g opponent contrast and likely explains why mixtures of red and green paints produce such dark neutrals. The cancellation effect only occurs in the spectral area where the S cone outputs are effectively zero, so it likely creates unsaturated color zones (darkened yellow or red color sensations), and explains why a "yellow" sensation in surface colors cannot be produced by the partitive mixture of red and green dots. And the minimal luminance change produced when "blue" or "yellow" light are added to "white" light suggests that luminance adaptation is not involved in the chromatic adaptation to shifts in daylight chromaticity. Overall, the chromatic enhancement produced by the S cone, and the cancellation produced by the L cone, introduce many complexities to color perception. The HK effect and related additivity failures demonstrate that brightness/lightness and hue purity are not independent dimensions: one attribute affects the other depending on the level or intensity of both. We saw a similar interdependence of hue purity and brightness contrast in measures of brilliance, and it is a general feature of color vision. It implies that our idea of color as separable colormaking attributes or dimensions, each varying independently of the others, misrepresents the integrated and highly dynamic nature of color perception. Hue and Saturation. A second geometry arises in the linkage between hue and hue purity, which is the geometry of a chromaticity diagram. This was intensively studied in an effort to develop a reliable colorimetric measure of apparent color difference between two similar colors. How well do we discriminate among more muted colors defined inside the two dimensional chromaticity plane? These measurements are much more arduous to collect, but in the 1940's W.D. Wright and David MacAdam did so for fixed test colors of lights differing in hue and saturation but having constant brightness. MacAdam took the novel approach of asking subjects to match exactly a test light with a mixture of primary lights, then used the margin of error in primary mixtures accepted as a match across repeated test runs to define the perceptual minimal limits of color difference. These error boundaries around the 25 test colors in MacAdam's study are indicated by ellipses placed in a standard chromaticity diagram (CIE 1931 standard observer, above left); the size of the ellipse symbolizes the amount of hue and/or saturation change necessary to produce a visible difference in color. It immediately appears that the ellipses are not equal in size, shape or orientation. We see that the CIE 1931 diagram does not represent equal perceptual distances as equal distances in the chromaticity space; it grossly expands the area of green colors in relation to blues and reds. This is fundamentally a problem of projecting a curved color space onto a flat surface  the same problem that causes Greenland to appear larger than Africa on some world maps.  Matching saturation is generally a more difficult or unreliable task than matching hue (hue discrimination is more acute than chroma discrimination): in both diagrams (above), the ellipses are elongated toward the white point (W).  There is a general tendency for saturation discrimination to come at the expense of hue discrimination, and vice versa. Saturation discrimination is weaker than hue discrimination in reds, yellows, greens and blues, and hue discrimination is weaker in the "mixture" hues blue green, violet and magenta.  Discrimination errors are elongated in a Y pattern toward the three corners of the chromaticity diagram. These three corners are defined by (1) an increase in the S cone outputs relative to the L+M outputs (blues), (2) an imbalance of L over M outputs (reds), or (3) an imbalance of M or L cone outputs (greens).  Discrimination is relatively better (the ellipses are smaller) around the white point; it is easier to match hue and chroma in tints of white than to match the chroma strongly saturated colors near the spectrum locus.  Both hue and saturation discrimination are most acute in the yellows and oranges where the L and M outputs (the r/g opponent function) are most nearly in balance.  Chromaticity matching is optimal in large stimulus visual areas (around 10° wide); matching grows worse as color areas become smaller, especially when less than 1° wide (foveal images).  Chromaticity discrimination is much worse when the color matching is done within a surrounding area of contrasting chromaticity.  Discrimination degrades at low levels of luminance; in particular, sensitivity governed by the S cones substantially declines at low luminances. Hue Spacing (Hues Combined). I presented earlier the spectral hue spacing as predicted by the CIE UCS. That diagram should be applied only to the hue spacing of colored lights, whether monochromatic or complex spectral mixtures. What about surface colors? The diagram below shows the spacing of hues in the chroma based aCbC plane in CIECAM, an opponent dimension color appearance model. Hue is indicated by (1) colored circles for spectral hues at 10 nm intervals as defined by the CIE 10° observer (wavelength indicated in italics); (2) black dots for average hue angles of target colors the Munsell Color Order System; and (3) colored dots for the approximate location of the four unique hues. under illuminant D65; inner circle: consensus location of the four unique hues (Kuehni, 2001); middle circle: markers for Munsell hue angles averaged across 9 color targets (V = 5, 6 and 7 at chroma C = /8, /10 and /12); outer circle: spectral hues in 10 nm intervals based on 10° observer; percentages refer to proportion of 410 nm "violet" in extraspectral mixture with 680 nm "red"
The overall even spacing of the Munsell hue markers suggests that CIECAM aproximates quite well a perceptually uniform spacing of surface colors. The spectral hues corresponding to the ends of the CIECAM a-, b+ and b- opponent dimensions  at 442, 493 and 575 nm  agree well with the spectral location of the y/b function peak, unique yellow (r/g function null value) and unique green (y/b function null value) found in the theoretical opponent functions. But other opponent function landmarks  unique blue (r/g function null value) at 472 nm, the r/g peaks at 524 nm and 610 nm, and the y/b peak at 554 nm  are orphaned. Perception of lights and perception of surfaces are effectively different sensory domains within the same sensory modality  not unlike the difference between music and noise. For that reason, the visual complementary hues identified in the CIE UCS (and other CIE chromaticity diagrams or cone excitation diagrams) do not match the complementary hues in CIECAM. This is evident when we connect the location of spectral blues with their yellow or orange visual complements in the CIECAM acbc plane (diagram at right). All the lines are sharply bent toward green rather than straight, and the same displacement appears in CIELAB. This is not a flaw, because the hue circles in both CIECAM and CIELAB reproduce quite well the visual complements defined in Munsell (lower diagram, right). Surface colors and light colors scale differently, and CIECAM scales surface colors accurately. The diagram above also makes clear that (always with the exception of yellow) the Hering unique hues do not define the ends of the opponent dimensions. The opponent functions are important in accurate hue scaling, but the unique hues are not. These observations underscore the important structural differences between light and object colors, and the crucial fact that, contrary to Hering's conjecture, the structural foundations of color vision do not intrude themselves into color experience as "fundamental" colors or universal color concepts. In a perceptual system that is so subtly responsive to context, there is no absolute, single standard for hue spacing and complementary hue pairings. 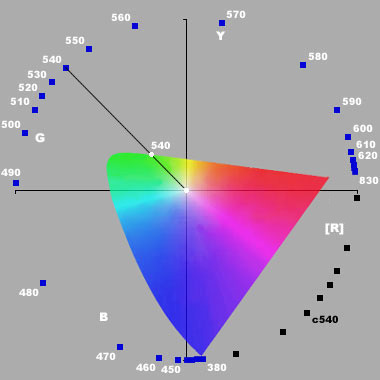 CIELUV adequately describes light mixtures, and is useful as a chromaticity diagram in video or computer related color applications. The Munsell color system is free of theoretical or geometrical distortions, but seems to include empirical inaccuracies in the spacing of hue and chroma. The CIECAM model is based on opponent dimensions that seem to compress the spacing of Munsell blues and greenish yellows. The overall disagreement between the Munsell and CIECAM systems is relatively small. See also the page synthesis of surface colors. Other Structures. In particular, luminance and spatial contrasts have a dominant role in the perception of surface colors. Isolated light mixtures are easier to manipulate and measure as color stimuli, and in principle can stimulate to the limits of the visual system, and many generalizations about color vision are based on them. But care must be taken to distinguish clearly between spectral colors and surface colors when reading or thinking about color, or using color principles in design. This analysis does not recover anything resembling the colormaking attributes or the opponent functions. The fundamental dynamics of color perception do not appear to be based on these. Hue discrimination and the HK effect show that hue and chroma, and chroma and brightness, are functionally interdependent at several stages of color vision. The colormaking attributes are meaningful when used in combination to describe, model or predict the conscious experience of color, but they are weak when considered as abstract dimensions of color  especially when used to describe lightness or brightness separate from hue and chroma. Both violet (purple) and red violet (the boundary hue between violet and red) have been neglected in color vision research. In part this is because they are not found in the visible spectrum, and therefore have been assumed to be outside the adaptation logic of the visual system; and in part because they are not among the "primitive" color terms in natural color lexicons, and therefore less relevant to issues of color standardization and communication. For similar reasons, the "in between" boundary hues green yellow, green blue and red violet have been ignored in favor of prototypical unique hues yellow, blue, green and red. The analysis described above suggests the potential importance of these extraspectral and boundary hues to the investigation of visual structure and function. Response compression exerts its effects throughout the visual system. In lightness perception, response compression expands lightness contrast in low reflectance surfaces, minimizes lightness contrast in high reflectance surfaces, and represents most of the increments of an equal interval luminance scale as values above a medium gray. In hue purity perception, response compression expands chromatic contrast in saturated colors, minimizes chromatic contrast in dull colors, and represents most of the increments of an equal interval excitation purity scale as colors below "intense" saturation. Color measurements are normally made with the color presented against a background neutral gray, the adaptation gray. Small color differences are especially noticeable in the contrast between adjacent color areas. Large color differences or differences between visually distant color areas may be compressed or distorted in order to render the complete range of colors in a visual context. For reasons of historical research convenience, analytical precision and practical measurement, the color matching foundations of colorimetry are derived entirely from light mixtures. Yet, given the proportion of developmental years that humans spend looking at objects rather than lights (including "soft copy" lights such as televisions or computer monitors), there is no question that surface colors are the fundamental visual context that color vision is adapted to represent accurately. Despite the fact that physical color appearance is very far removed from the original cone excitations, surface colors are the framework within which all color phenomena must be rationalized or modeled. Many aspects of color geometry are adaptations to enhance the interpretation of surface colors under natural light sources, and may appear to be design flaws if light perception is the standard of evaluation. Perhaps the most significant and underreported fact to emerge from color research is the large individual variations that characterize our collective color experience. These variations have been justifiably suppressed in the color vision literature in the pursuit of a consensus or "average" color description that can drive standard models of color vision and standard methods of color measurement. For artists, who must work within a personal esthetic vision and color sense, individual differences in color vision are less easily dispensed with. Let's see what we can infer from the scraps of evidence available. Comparisons between different observers, whether in the same or a different experiment, present a discouraging picture. Although observers agree on certain major trends, individual differences are best described as enormous (Human Color Vision, 2nd ed., p.343). When one confines the intercomparison [between subjects] to a particular location in the chromaticity diagram, the ellipses of different observers are quite often not in close agreement. Rather, larger discrepancies are noted in the orientation, size and shape of the ellipses (Color Science, 2nd. ed., p.323). Individual differences appear clearly in opponent hue cancellation experiments. The exact shape of the opponent curves and the resulting hue discrimination differ significantly from one person to the next, probably because of individual differences in the proportions, distribution and photopigment chemistry of the L, M and S cones, and in the optical density of the lens and macular pigment. The example at right shows hue cancellation curves produced by Hurvich and Jameson themselves, who presumably knew what they were doing. One researcher, compared to the other, required roughly twice the amount of "yellow" unique hue to produce spectral matches from middle green through red. The contours of photopic sensitivity also show large variations across individuals with normal color vision. The example below, from an early study, shows the range of individual variation across all wavelengths. I have indicated for three wavelengths the size of individual differences as a percentage of the average value. For a "yellow orange" wavelength (600 nm) the variation is 58% of the average value; this is smaller in the "green" span of the spectrum but becomes large again in the "blue" span (below 500 nm). The range in peak values is roughly 540 to 570 nm. The method used, in which the brightnesses of similar spectral hues are matched, step by step, across the entire spectrum, is not the most reliable, but comparable variability appears in other methods. For example, in a study using flicker photometry, the range of peak values was between 549 to 570 nm. Similarly large differences appear in one of the most carefully controlled color matching studies by Stiles and Burch, both in the primary color matching functions (above) and in the location of the spectrum locus in an r,g chromaticity diagram (below). In general these show large variations in the tinting strength of the red primary light, especially in the "out of gamut" hues between "green" and "violet" that must be desaturated (negative r values) by added "red" light. An irrefutable and disconcerting example is in the large variation in unique hue choices across individuals in different color perception studies. Here viewers are put the simple task of choosing, for example, the specific yellow that appears to contain no tint of red or green. The general picture, illustrated at right, is not the same for all hues. The narrowest variations occur in the choice of unique yellow, and second for unique red, which indicate generally better agreement across individuals on the "warm" side of the color space. Much larger variations appear in the choices of unique blue and unique green. The variation in green, which covers one quarter of the hue circle, deserves a closer look. Illustrated below are the results from a single study in which 50 men and 50 women viewed moderately bright monochromatic (maximally saturated) green color patches that were 1° in diameter (twice the apparent size of the full moon) and seen against a white background; patches were viewed for one second with a 3 minute rest period between viewings to eliminate chromatic adaptation effects. The subjects were asked to indicate whether each green contained some yellow or some blue, and the color adjusted accordingly until their unique green was located. As a whole, the color vision literature is also vexed with inconsistent results of the same visual effect or mechanism across different research methods. This certainly means context matters: in most cases the variation in responses across different studies is much larger than the variation in responses by the same individual in the same study. But it is often difficult to account for the variation in terms of the study methods or a generic model of color vision. It may be that individual differences in the same situation mean individuals adapt differently to different situations, and color experience is actually more diverse than it seems in a single study. These large individual variations in color perception compromise the specific claim that "colors have meanings". To "communicate", colors must have a consistent stimulus specification (the red in all traffic lights is the same) and must be used in well defined contexts to declare a conventionally preassigned meaning. These helps are less available in the visual arts. Artists can impose a consistent personal specification, context and meaning through the painting habits called a "painting style". But a new and unfamiliar style of art will use color in a new way, communicate very different things to different people, and thereby stimulate pointless debate about what color in art "really means". To conclude, we look at how color appears in words, and whether the language shape of color provides insights into fundamental properties of color perception. Most of the evidence comes from color naming studies conducted by anthropologists and cognitive psychologists across different languages. The anthropological data (called the World Color Survey) records the names assigned to Munsell color samples by 2700 native speaking respondents in 110 different language cultures. The psychological data includes measures of consistency and reaction time in the choice of color names in color naming tasks, and tests of color discrimination in infants and children. Results from these investigations have been sadly underutilized, because they are largely embroiled in the debate between two opposing theories: (1) color names depend entirely on the need for color distinctions imposed by the environment or culture; or (2) some colors are perceptually more basic than others, are named first, and must be defined in the language before other color words can develop. The developmental scheme proposed by the second theory is shown in the following schematic. In Anglo Saxon or Old English (c.600-1150 CE), and from there back into the reconstructed Indo-European lexicon, light/dark was the predominant sense of color related words; God, intelligence, intellect, insight, the sun, light, flashing reflections, metals and fire were all described with the "white (bright)" word. At this stage the concept of "color" as a perceptual attribute does not really exist. For example, the ancient Greeks defined color as a material attribute, so other material qualities or physical changes were also identified with color names  especially "black" or "white". Color words also denoted surface qualities ("black" was due to roughness), optical quality ("white" translucence), reflectivity (a "white" mirror), color intensity or chroma (a "white red" was an intense red), physical composition ("blue" was associated with air, "black" with earth), or chemical origin (pigments made by a similar method of manufacture, regardless of hue). Indeed, Greek color words appear so haphazardly in ancient texts that the 19th century philologist W.E. Gladstone concluded that the Greeks were colorblind!  Next, languages separate the "light+warm" into two terms, dividing "light" (white) from warm (red+orange+yellow+brown) but keeping the dark+cool term (black and green+blue); violet hues may belong to either category. Thus the primitive distinction between hue and lightness emphasizes the warm hues.  The separation of grue (green+blue) from black comes next. This contrast also implies that surface values can now described as graded mixtures of two bipolar attributes: light/dark and warm/cool.  All the Hering unique hues (red, yellow, green, blue, black and white) are contrasted and named before other color names are added. The etymological roots for all these color names go back to the Indo European lexicon, but they achieve separate hue meanings only in Middle English (1100-1500).  If there are seven or more color concepts, the words for purple, brown, orange, pink (all warm colors) and gray are all added before green or blue are divided further (for example, into "ultramarine," "turquoise" or "chartreuse"). These are all binary colors compounded from the six unique hues: purple is a red blue, brown is a yellow black, orange is a yellow red, pink is a white red, and gray is a white black. In English, these compound hues  names for mixtures of the basic hues  do not begin to appear until late Middle English (1350-1500).  Finally, the linguistic marking of chroma or intense versus dull colors appears only relatively late in a color lexicon. In English, this marking does not appear until the late 1600's (Newton's "fiery hues"), and we find the 19th century English art critic John Ruskin still struggling with it. Perceived color similarity also appears in the alternative or mistaken names that children and adults apply to an ambiguous color. It's very easy to find a color that some people will call green and other people will call blue, but it's not possible to find a green that anyone with normal vision will call red. These color labeling tasks again support Hering's exclusion of red/green or yellow/blue hue compounds. In addition, people in many different cultures can name "pure" examples of the Hering hues more quickly and consistently than compound or borderline colors. And when asked to pick the "best" yellow, red, green or blue from a large array of colors, individuals choose the color that most closely match their perceptual unique hues as measured with a hue cancellation or color comparison method. Not surprisingly, in the same way we still rely on the ancient wheel more than the modern computer, the earliest words to appear are also the most frequently used today, with a few qualifications. Frequency counts of words in written English (right) show black and dark (plus white and light) leading the parade. The only hue terms equal to these are red, blue and green. The remaining hues are all "warm" hues  brown (dull orange), yellow, pink, orange and the gold not found in the business section. When these are added to red, their "warm" total (0.031%) is greater than the combined "cool" total of blue, green and purple (0.022%). The cadre of academics who dispute any version of the Berlin and Kay hypothesis tend to focus on the fact that the research methods do not reveal how color terms can refer to a variety of appearance attributes, such as succulence or gloss, and can be used in a variety of metaphorical ways  red with rage, green with envy. But it is hardly reasonable to reject the anatomical study of dogs because anatomists ignore the fur and fleas. The task of naming colored chips seems to be easily done by people in all cultures, and the surface uniformity of the chips limits the salient attributes to color differences. The perception of color always appears attached to objects, so it is practical and sensible for cultures to make distinctions among objects in terms of attributes that are more important than color  the rotten apple rather than the brown apple, the spring leaves rather than the yellow green leaves, my shirt vs. the red shirt, etc.  or the attributes of size, shape and spatial location that distingish objects in context. If necessary, similar objects can be distinguished using relative differences in lightness or brightness, surface texture or pattern, or differences in ownership or condition. Even in western cultures, color words are almost never essential for day to day work and chatter. Abstract color concepts seem to become necessary, and emerge in a language, only after a new cultural practice, task or skill  such as fashion, ornament, manufacturing, art, agriculture or medical diagnosis  makes color distinctions within the same types of things (textiles, gems, masonry, paints, plants, wines or skin lesions) important. Indeed, it appears that several cultures have actually lost color terms, although this seems to happen by discarding color names that are relatively more complex in the Berlin & Kay scheme. If we accept that human vision can distinguish as many as a million unique colors, then our lexicon codes less than a fraction of 1% of that diversity. This means that color terms inherently carry a stupefying level of imprecision: we cannot expect to request a "white" paint and buy a color that will actually match our walls. Instead, every language culture (and technical subculture) has developed a complex system of conventions that dictate how color perceptions and color discriminations are to be defined, described and communicated in relation to objects or task purposes  in English, for example, a "red" wine, a "red" sunset and a "red" face are not at all the same color. These complex rules are not assessed at all in the color literature. Finally, not all color disciminations or labeling tasks are equal. The opponent gradations of the light/dark distinction may be fundamental because they are instantiated in the solar light cycle, and because they fit with the universal semantic capability to define opposition or negation. In contrast, categorical distinctions such as hue or "color" require the recognition of combined attributes, which may have been sharpened or ignored because the culture places more or less emphasis on certain color discriminations. Finally, chroma distinctions are not well researched in color vocabularies (perhaps a cultural bias of the color researchers), although the best conclusion is probably that they are relatively unimportant in most languages; here the natural environment, which is overwhelmingly populated by dull colors, may make chroma distinctions inconsequential. When we tally up all these complicating factors, however, it seems to me we strengthen rather than weaken the case for the perceptual saliency of the unique hues. After all, if they were not salient, consistency in the experimental tasks would be overwhelmed by the cultural complexities. The fact that patterns emerge despite the cultural idiosyncracies proves that there is a universal foundation, whatever variations there may be in the cultural edifices. The decisive point: agreement is poor across different language cultures in the perceived boundaries between one color term and another: the same orange may be grouped with red in one culture but with yellow (or "tan", or "warm", or "light") in another. But across all cultures, the focal color or best exemplar for a color, when chosen from a complete array of saturated color samples, is consistently located within a small area of the color surface, as shown below for the most saturated Munsell color samples across different hues and lightnesses. The academic debate about the primacy of the unique hues seems to me largely to depend on how the problem and evidence are considered. On that note I have my own observation. The fact that colorblindness was not recognized until the late 18th century indicates the relatively trivial role that color recognition plays in routine human life and in any technical tasks common to human history up to that point. Paradoxically, this color triviality is the reason colors can be used as arbitrary symbols in many different areas of a culture  cuisine, cosmetics, institutional uniforms, ceremonial or ritual dress, fashion, interior furnishings, architectural decor, advertising ... and of course, art. The most recent review of research on language and color is the edited volume by C.L. Hardin and Luisa Maffi. There is a favorable academic presentation of linguistic color research with examples of confirming and contradictory findings posted by Robert MacLaury. For deep drilldown, see also the dissenting views by Barbara Saunders and Jan van Brakel.